Clean your printer extruder to have a better maintenance of your 3D printer and also increase the lifetime of your hotend. When you use different filaments in you 3D printer, eventually you can get obstructions and defects in your printings. 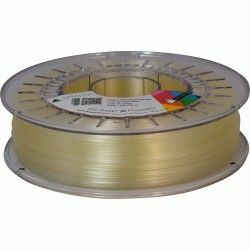 This filament is thought out to clean the extruder completely. This way you will guarantee the correct working and maintenance of your 3D printer. in your 3D printer previously, you should set the extrusion temperature at 250ºC aproximately. After that, load our SMART CLEAN FILAMENT and extrude a certain amount of material. Finally, unload the filament and reload your 3D printer with the material you want to use.